Canoeing House, on the banks of the Jefferson River, offers several services to Lewis and Clark enthusiasts. Kayak and canoe rentals are available, which includes parking at our private landing, a shuttle up river, life jackets and paddles. 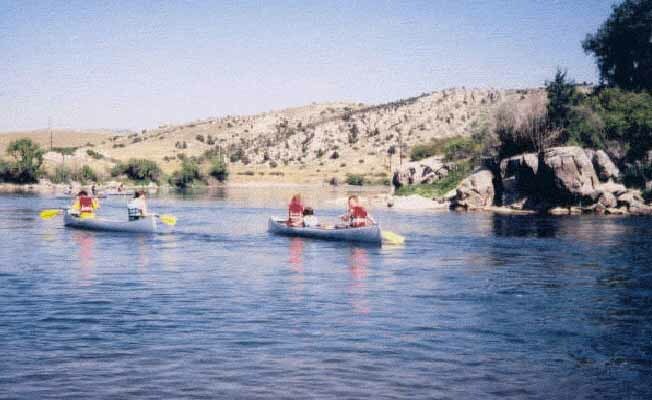 These paddle-your-own trips are a great way to involve yourself in the Lewis and Clark experience in the Headwaters of the Missouri area. The Canoeing House offers free trip planning for multi-day canoe/camping trips. Secondly, guides lead individual or group canoe trips. These trips have rates depending on the numbers in the group. Guides stop at official Lewis and Clark encampments, read journal entries, locate wildlife, watch for birds and teach about watershed resources. Guided fishing trips on all the great rivers of the Greater Yellowstone Basin and Headwaters of the Missouri challenge the avid fisherman. Guides row deluxe McKenzie River boats, teaching flyfishing, stream entomology and numerous uncanny tricks in order to catch the Mighty Western Brown Trout.